UF Health teams who operate unique machines that help keep patients alive at their most vulnerable moments have been honored with an international award for excellence. The Extracorporeal Life Support Organization has given UF Health its Gold Level ELSO Award for Excellence in Life Support for its exceptional care in using extracorporeal membrane oxygenation, or ECMO, in both the pediatric and adult programs. ECMO is a process where blood is pumped through an oxygenator outside of the body because a patient’s heart or lungs aren’t working as they should, said Tim Bantle, R.R.T., the ECMO coordinator for UF Health. ECMO arrived at UF Health in 1991 primarily as a neonatal program. The adult program began in 2015. ELSO is an international nonprofit consortium of health care institutions focused on developing and evaluating therapies for supporting failing organ systems. UF Health was recognized for using the highest-quality measures in patient care and providing a healing environment in regard to training, education and communication. 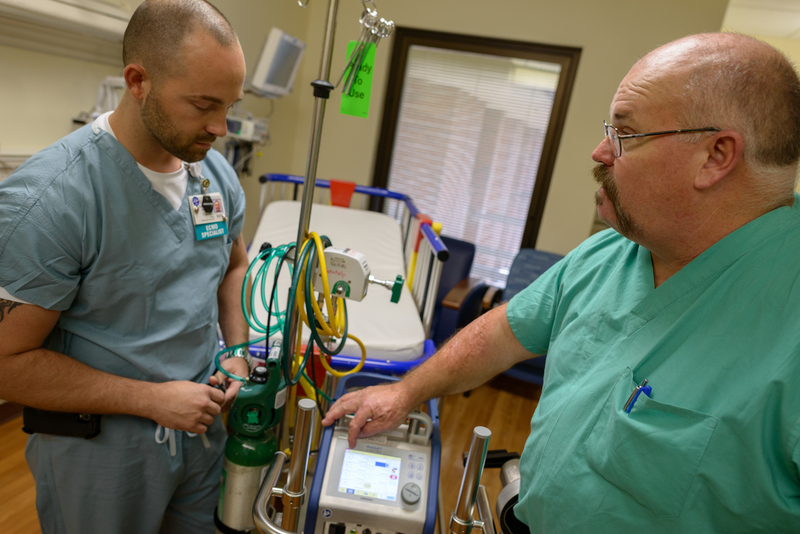 Since the program’s beginning, UF Health has cared for 589 patients using ECMO and has a survival rate of 76 percent. Before the adult program, he said UF Health was seeing about 25 to 30 ECMO cases a year. This past year, the team saw 70. Bantle said earning the ELSO award can be attributed to a lot of factors, but one of the biggest is the support of UF Health administration. For Saleem Islam, M.D., M.P.H., the director of the pediatric ECMO program, the award recognizes the hard work being done by the faculty, nurses and ECMO specialists. Tiago Machuca, M.D., Ph.D., director of the adult ECMO program and an assistant professor of surgery in the UF College of Medicine, said his favorite part about being involved with UF Health’s ECMO program is seeing patients recover when their risk of dying far exceeds their chances of surviving. “When you’re able to act on that situation and turn around a patient’s outcome … to seeing the patient recover and walk out of the hospital, that’s the best part,” Machuca said. Receiving the ELSO Award reinforces the hospital as a center where commitment to patient care is exceptional, he added. This will allow the ECMO program to continue to grow. For more information contact: Rossana Passaniti at passar@shands.ufl.edu or at 352-273-8569. Tiago N Machuca, M.D., Ph.D.